Once again, I wish to express my deepest thanks for your active participation during the 8th Global Forum. I also reiterate my profound gratitude to the State of Qatar and the then Secretary-General, Ban Ki-Moon, for putting their confidence in me and entrusting me with this important task of leading the Alliance during the past 5 years. I am highly grateful to the Governments of Spain and Turkey, the co-sponsors of the Alliance and to all members of the Group of Friends. I wish to also extend a special thanks to the Secretary-General, H.E. Antonio Guterres, for his efforts in support of our work. Last but not least, I am also very grateful to my Chef de Cabinet and all my staff, for their tireless efforts and the excellent support and guidance they afforded me throughout the Forum and during my tenure. We are all too aware that despite unprecedented progress in the most recent history of humankind, there are still many threats in achieving peaceful coexistence between people of different cultures, religions and ethnicities. The 8th Global Forum provided a unique platform for exchanging ideas, engaging with existing and future partners and re-affirming our commitment to the prevention and sustaining peace agenda. During the course of two days, we identified several crucial pathways to achieve our shared goals. First, we reaffirmed our commitment to pluralism and mutual understanding, recalling that no individual should be marginalized and treated differently because of who they are, or what they look like, or where they worship. During the discussions, participants identified challenges and good practices in building, restoring and solidifying trust between people across cultural and religious lines. To this end, inter-religious and inter-cultural dialogue is a useful – though often neglected – soft power tool to achieve greater mutual understanding and trust. But these dialogue processes should not remain the sole prerogative of theologians and anthropologists. We should continue to carve out space for community-leaders, youth groups and women to engage in inter-religious and intercultural dialogue in order to support efforts at conflict prevention, reconciliation, and social cohesion. Second, we recognized that media play a powerful role in influencing thoughts, perceptions and opinions about migrants and refugees. Oftentimes, however, media could be exploited to perpetuate discrimination, exclusion and the incitement to hatred and violence. Against this backdrop, participants explored the role of media professionals in combatting misconceptions and prejudice in a context where communities are confronted with challenges related to the arrival of refugees and migrants with diverse backgrounds, cultures and religions. We discussed replication of successful initiatives to prevent inaccurate, negative narratives against migrants and refugees, including by amplifying the voices and experiences of migrants; And we identified good practices in improving the quality of media coverage about migrants and refugees, notably by promoting accurate reporting and ethical journalism; building partnerships between media and civil society; and preventing hate speech on online. Third, we committed to enhancing the systematic and meaningful participation of women in peace processes From Colombia to Sri Lanka, Afghanistan to Timor-Leste, women have played instrumental roles in conflict resolution and prevention. Yet we still have a long way to go. Women continue to be marginalized or excluded in many formal peace processes. All too often, they are viewed as victims rather than as agents of change. The Forum provided an opportunity to shift this narrative. Peace agreements will lack legitimacy if male combatants are the only ones at negotiating tables. If we want to achieve meaningful and sustainable conflict resolution, inclusive peace negotiations are a must. This involves enlarging women’s representation as mediators, negotiators, witnesses and signatories in peace process. Fourth, we intensified our efforts at mobilizing the transformative power of the world’s young people. As in previous Forums, we provided a unique platform for showcasing young people’s capacity, agency and leadership. 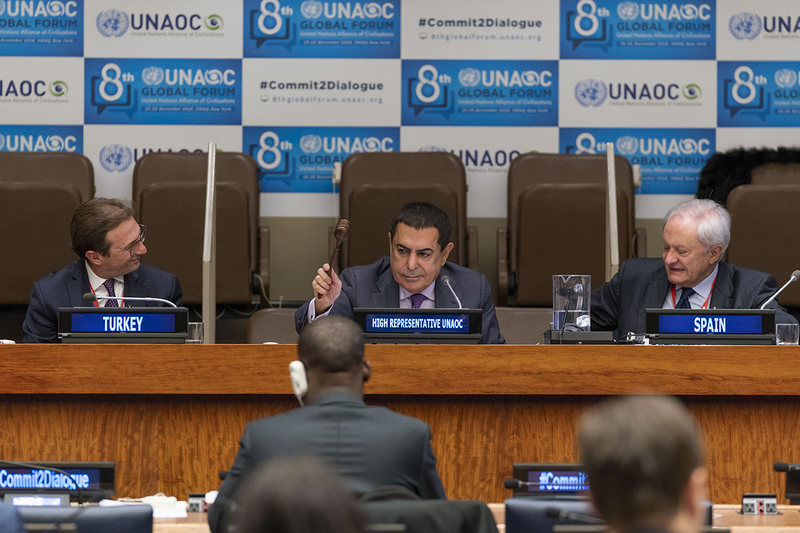 This year, over 100 youth Alumni from UNAOC’s programming shared good practices and experiences in preventing and resolving conflict and violent extremism. This is yet another positive example of how the Alliance is not only working for youth, but with youth. Fifth, we highlighted the virtues of Global Citizenship Education. This involves building a sense of belonging to a common humanity – not an imagined community created by and for a select few. We must draw on the lessons learned and empower students of all ages with the tools needed to address our global challenges. Sixth, we provided a platform for forging new public private partnerships. I am pleased to note that in the course of the past two days, we launched several strategic projects and partnerships. They include two Memoranda of Understanding: one with the Silk Road Institute and another with the Organization for Democracy and Economic Development (GUAM). Our youth Alumni collaborated with UN system partners to prepare recommendations for implementing the UN Youth Strategy. The Alumni will prepare a summary report containing their recommendations to present to the UN Youth Envoy. In a similar spirit, I am delighted to announce the project Empowering Youth Volunteers through Sport. The implementation will start in January 2019. project could not be possible without the generous financial support of the European Union. As a part of the cooperation agreement signed in Baku at 7th UNAOC Global Forum, we are partnering with Save the Dream foundation, in a two-year project aimed at developing a common doctrine on “Sport Volunteerism” as a force for interreligious dialogue, equality, peace and conflict resolution. It is coordinated by the International Olympic Truce Center (IOTC) and involves National Olympic Committees, Universities and Youth Organizations. The project could not have been possible without funding from Erasmus+ Sport programme. I am also pleased to note several Member States pledged to continue their support for ongoing UNAOC project activities. And finally, during the Ministerial Group of Friends meeting, we had the opportunity to review the five-year period of the implementation of UNAOC’s Strategic Plan. I thank the Group of Friends for their constructive feedback and guidance. I encourage all member of the Alliance to continue to make a positive impact on the future work and direction of UNAOC. I will remain available in the next couple of weeks to meet with the co-sponsors and any Member of the Alliance to hear more of your views on current and future work and direction. We live in a world that will only become more interconnected and smaller. We must confront this reality head on with courage and foresight, united by our ideals and not divided by our differences. Regular, constructive encounters within and between societies are the best antidote against division. Only by shifting the perspective from fear and ignorance, to mutual understanding and dialogue, will we propel humanity towards a more inclusive, peaceful and secure world. In so doing, we must never lose sight of the importance of promoting and protecting human rights as a precondition for peace and security. In less than a month, we will commemorate the 70th anniversary of the Universal Declaration of Human Rights. The Drafters of the Declaration, who were representatives with different legal and cultural backgrounds from all regions of the world, penned a shared vision of our common humanity. It begins with a universal truth – that “Recognition of the inherent dignity … of all members of the human family is the foundation of freedom, justice and peace in the world”. It is not surprising that the Declaration remains the most often cited human rights document. It is the universality of its 30 articles that gives the Declaration its deep resonance. It is the universality of our shared identities and shared sense of dignity that we must faithfully promote and defend. This year, we also observe the 70th anniversary of the adoption of the genocide Convention, the first international Convention signed on 9 December 1948, 1 day before the Universal Declaration of Human Rights was adopted. And 9 December also marks the International Day of Commemoration and Dignity of the Victims of the Crime of Genocide and of the Prevention of this Crime. Today, the consequences of not respecting the principles contained in the UN Charter, the Universal Declaration of Human Rights and other international covenants can be witnessed in all corners of the world. We can and must do more to reclaim the inherent dignity of the human person if we are to prevent future societies from descending into horrific violence. Along with new forms of conflict have come new responsibilities and approaches to confronting these challenges. But they cannot be confronted alone. We must marshal the full force of the Alliance. Establishing peace through dialogue and broad partnerships constitutes a necessary cornerstone of stability. Let us leave this Forum with a renewed determination to collaborate, to share innovative solutions and live up to the commitments we set for ourselves. I thank you once again and congratulations for a successful Forum.